The biggest drive-in cinema in Central China, Lezhihui Cinema of Wuhan （Add：538. Jiangcheng Boulevard 江城大道538号）, opened at the BBos Auto Plaza in Zhuankou on February 8, 2017. This drive-in has three laser projection screens, with the primary one approximately 500 square meters in size and the other two about 200 square meters each. Projected onto the screens are digital pictures of high resolution at 120 frames per second, using cutting-edge 4K cinema equipment. The cinema, a sprawling location over 2,000 square meters in size, is divided into three sections (A, B, C), able to accommodate up to 500 cars or more than a thousand viewers at once. 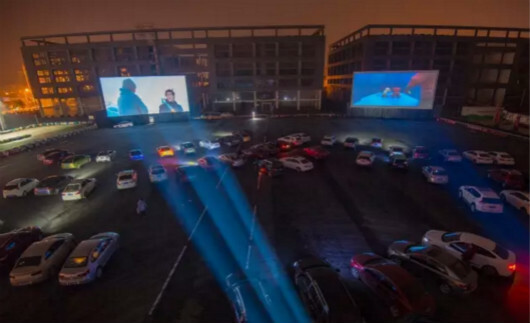 Sizable drive-ins like this one can only be found in big cities like Beijing, Shanghai, and Shenzhen, according to Mr. Liu Chenglong, the cinema’s executive director. The soundtrack comes in via FM signal and the three screens have different FM channels. After parking in a particular section of the cinema, customers can tune to the corresponding channel on their car radios. The cinema provides big hit movies from 7:00 P.M. until after midnight every night. Each car is charged RMB 150, with free car rescue service.